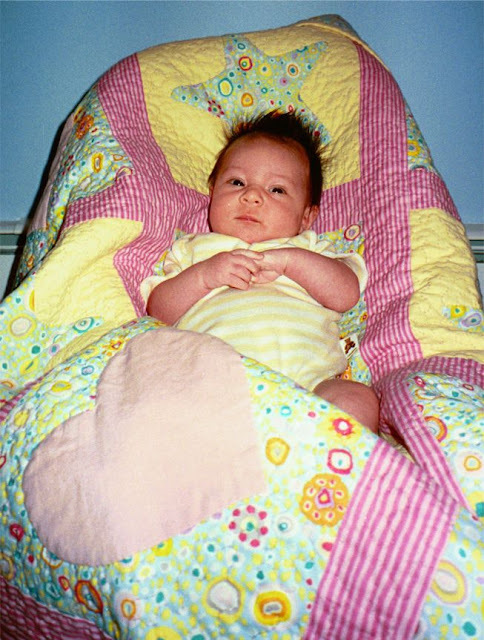 alidiza: My First Modern Quilt? Since my machine is still AWOL there hasn't been much sewing going on here this week so I thought I'd drag out something from the vault to show you. This quilt is unusual for several reasons. First, it was made in 2001, before the modern quilt movement had really gotten started and funny because 10 years later I'm still not sure I consider myself a "modern" quilter. The first time I saw Kaffe Fassett's fabric I couldn't figure out why anyone would want to use it. Maybe I just saw it enough times that it started to grow on me and then when I learned it was called Roman Glass, and I was just back from my honeymoon in Italy I decided to embrace it. While I'm still not a huge Kaffe fan, I have this in about six different colorways and it seems to show up in a lot of my projects. Anyway, I was in DC on business and had dinner with my best friend from high school who told me she was pregnant. I was still a childless workaholic but I figured I should make her a baby quilt and in the middle of the most boring PowerPoint presentation ever I had a vision for this quilt. This quilt was hand appliqued (I prefer needle-turn) and hand pieced. Even more incredible, it is the only quilt I've ever stipple quilted and I did it entirely by hand. Around the time I finished this the intended recipient had a boy and I found out I was pregnant. Alas, I never did make a baby quilt for my dear friend and this became Audrey's baby quilt. 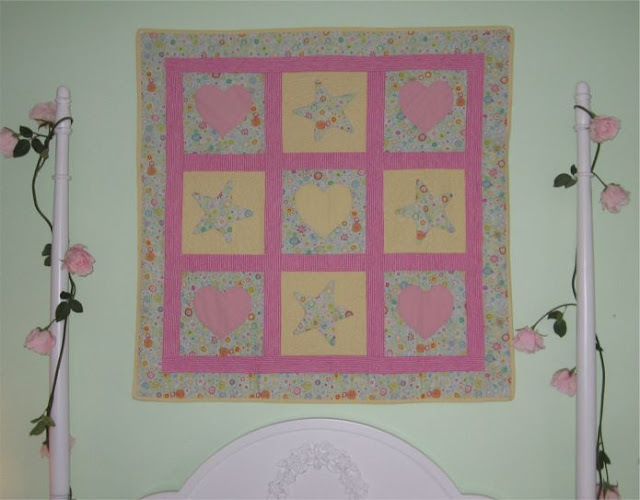 It also went on to win a ribbon in the first and only quilt show I ever entered and still hangs in her room. I love this. I too am not a big Kaffe fan and can never figure out how to use the fabrics. Love it! Happy birthday to Audrey! And I LOVE your new sewing table - I might steal that idea! That Jen.Pag. print is gorgeous!